Today’s question is from Susan and she wants to know about any potential yoga postures and or herbal remedies to help with a ganglion cyst on her knee. We did a similar blog post to this on a baker’s cyst not too long ago. According to the Mayo Clinic, ganglion cysts are noncancerous lumps that most commonly develop along the tendons or joints of your wrists, hands, ankles or feet. Normally ganglion cysts are round or oval and are filled with a jelly-like fluid. Small ganglion cysts can be pea-sized, while larger ones can be around an inch (2.5 cm) in diameter. Ganglion cysts can be painful if they press on a nearby nerve and their location can sometimes interfere with joint movement. Normally a ganglion cyst is treated by having it drained by your medical doctor with a needle, so it is extremely important to seek medical attention for your ganglion cysts. I am a Ph.D. in communications and cultural studies and a yoga teacher and so the treatment of ganglion cysts most likely falls outside of the scope of my practice. A ganglion cyst can also be removed surgically, although if there are no symptoms some ganglion cysts have been known to go away on their own. In researching for this blog post, I read an article by one doctor who felt that ganglion cysts are as a result of joints that are not moving properly or joints that are under constant strain. He felt that the synovial lining in the joint got irritated to the point where it began to get squeezed out from between the bones in the joint creating the ganglion cyst. If this is the case it is important to look at the way your knee joint is being strained on a regular basis. 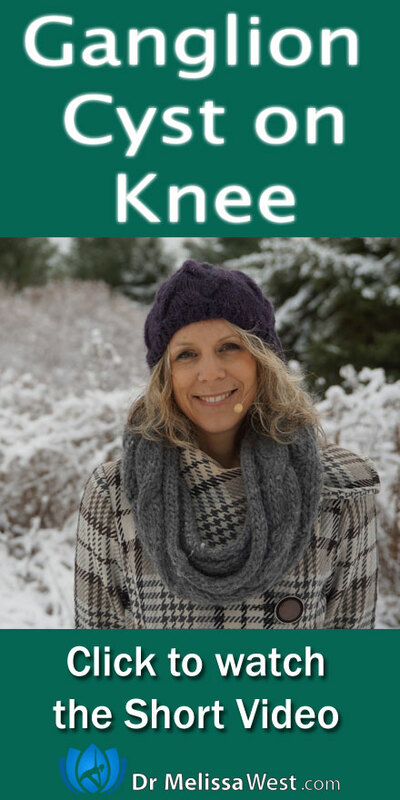 The tricky thing about knee joints is that the problem can often come from either your feet or your hips as well. I would recommend working with a chiropractor, physiotherapist, osteopath, naturopath, or other health care practitioner who has experience mobilizing joints. No amount of yoga is going to make the cyst go away. Once you have your MD drain the cyst with a needle, you can look at the root cause of the cyst by correcting the proper range of motion of your hip, knee, ankle joint or foot movement. Yoga for Arthritis Hips – This video focuses on range of motion of your hip joint while also building up strength around your hip joint.